Entrance into the “real world” is daunting for anyone, especially for those without job prospects. 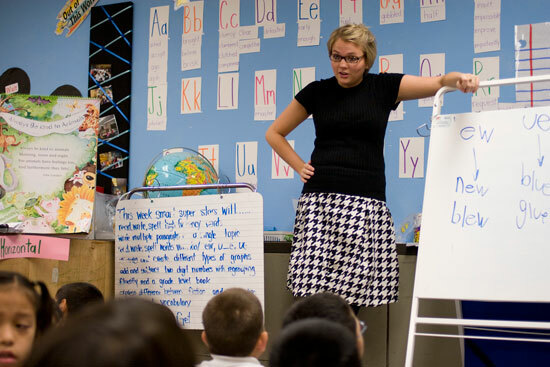 With employment particularly difficult to come by, Teach for America presents a promising alternative for new graduates. In 1990, Princeton University alumna Wendy Kopp founded Teach for America. With ambitious goals in mind, Kopp established a two-year program for recent college graduates to teach at urban, low-income public schools scattered across the nation. Because the program does not require participants to have degrees in education or the subject they teach, TFA is an option for a wide range of educated young people. But, depending on your commitment to teaching, TFA might not be the job for you. A college degree and an impressive GPA do not a capable teacher make, and being inspired by Hilary Swank’s character in “Freedom Writers” is not enough to ignite a genuine desire to educate. At the risk of sounding like a broken record from the Obama campaign, you must have the drive for change if you plan on entering this program. Unfortunately, not all TFA teachers seem to have this drive. The program has a 50 percent turnover rate after two years, and an 80 percent turnover rate after three years, according to a study by University of Texas education professor Julian Vasquez Heilig and California State U’s Su Jin Jez. These findings imply TFA workers’ commitment to teaching is fleeting at best, and self-serving at worst. While TFA hopes its teachers will make a lasting impact on their school system, an alarming percentage of the program’s members complete the required two years and essentially abandon ship for either graduate school in unrelated fields, or to pursue a different career path altogether. To be sure, TFA can open doors for those who care deeply about bridging the achievement gap that has plagued the U.S. public education system for decades. The statistics are undeniable. America, one of the world’s most powerful nations, lags behind a majority of the developed world in its public school students’ math and reading aptitude. Texas public school students rank 49th in verbal and math SAT scores and have the 36th lowest high school graduation rate. It is distressing that participating in a program with such noble goals is so difficult. TFA now accepts fewer than 20 percent of applicants, and a recent article in The New York Times compares TFA acceptance rates to those of Ivy League colleges. Perhaps for those genuinely interested in improving American public education, however, the stiffened competition for acceptance into TFA is a blessing in disguise. With so much talk about TFA’s selectivity, the University of Texas has still had an impressive showing. Eighty students from the UT class of 2010 were to begin teaching in the fall, and the program ranks UT No. 1 among large colleges for student contributions to the program. Such a strong representation in the program is beneficial for Longhorns with a genuine interest in working toward TFA’s goal. As TFA’s target audience, we must ask ourselves where our priorities lie. Do we want a moving 24-month experience before pursuing a completely unrelated career, or do we want to work beyond the two-year commitment toward improving a flawed system? If our generation and its ever-increasing cynicism fails to follow up on our idealism, who will?